A while ago Maplin Electronics had a close out sale. Audax were pulling out of the DIY market and Maplin, as suppliers, wanted to shift their old stock. As a result the AP100Z0, 4" woofers, were on sale for £5.99 a pop. Having used these, aerogel cone units in the past I bought 4 and put them on a shelf. A nice driver for a very good deal and a shelf full of drivers is something speaker builders are often faced with! Indeed that's where the tweeters for this design were too so it made sense to try and put them toigether. I was in the mood to build a small pair of loudspeakers and the tiny form factor of the TM025F1 made perfect sense. Fueling this design was an interest in TIs, at the time, current TAS5706B. This has since been replaced by the similarly specified TAS5756M although the 5706B is still available. The TAS5756M can be seen in my SBBT and Aliband designs where it's virtues are sung. The TAS5706B is a digital input, class D amplifier with an on board DSP. It accepts sampling frequencies up to 192kHz and provides an excellent opportunity for a compact, fully active, loudspeaker. Of course these days I would go with the TAS5756M, as it offers improvements over the 5706B, but both chips offer similar performance. From an electronics point of view the TAS5706B is only two channel in standard operation, so for a pair of 2-way, active, loudspeakers two chips are required. The chip itself accepts all the audio formats you'd expect but these are for chip to chip integration on a PCB. For integrating with the outside world an S/PDIF receiver is required. As far as audio standards go S/PDIF has stood the test of time, gone though multiple revisions and is present on a vast range of different peices of audio equipment. As a digital input it's the obvious choice. For compatibility including an asynchronous sample rate converter between the receiver and amplifier chips makes obvious sense. Digital filter coefficients, such as those used in IIR bi-quads, are sampling frequency dependent and require updating if the sampling frequency changes. As S/PDIF sources can range right across the board you never know exactly what you are going to get. Adding an ASRC allows the sampling frequency to the TAS5706B to remain fixed, but gives the flexiblity for the input rate, to the S/PDIF receiver, to vary without having any consequence to the filters used for integrating the drive units. Now the TAS5607B does offer a feature, TI call, 'bank switching'. This is supposed to offer the flexibility for the chip to do this automatically but unfortunately it doesn't offer what's required for such a demanding application (driver crossovers and their integration). The ASRC used was the SRC4192 from TI and the S/PDIF receiver the WM8804 from Wolfson Microelectronics, now a part of Cirrus. 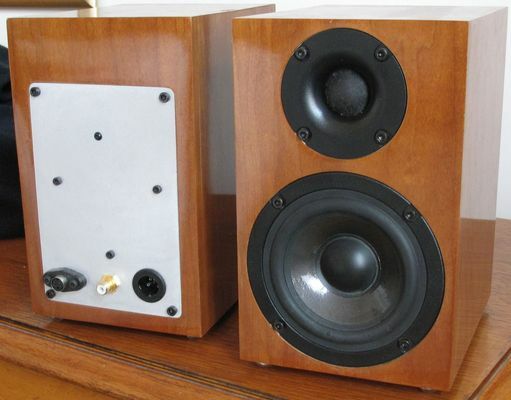 The loudspeaker cabinets themsleves were constructed from 9mm thick MDF. This is quite the departure from the standard 18mm stuff that is commonly used and a world away from the 25mm stuff that I've used a few times. Given the application though the thinner material made the most sense. The small enclosure already has a limited volume and the thicker the cabinet material the more volume you lose. Yes the 9mm stuff isn't as stiff as the thicker stuff and in a larger cabinet that would actually be an issue with bending, or would require extensive bracing, but here it worked quite well. The same lovely cherry veneer, as used in the DayQ, was used here to pleasing effect. With regards to connectivity and assembly, the PCB was mounted to a plate of alumiunium to act as a heatsink for all of the electronics. A single phono connector was added for the S/PDIF input and an S-video connector and cable was used to send the speaker level signal to the second speaker. Control is provided by infrared remote control and power is supplied by a medical grade, 26V AC SMPS. Sadly I cannot locate a picture of the inside of the device. A picture of the infrared window is shown below and was made out of a section of 8mm perspex/acrylic rod with the IR receiver glued to the other rend. First up the tweeter and woofer in cabinet responses. As can be seen the woofers response is nice and smooth but has breakup issues approaching 4kHz. The tweeter has a depression centred around 5kHz but extends reasonably low for a non chambered neo dome. Given my penchant for excellent off axis responses lower, rather than higher, xover frequencies are always of the order. How low one can cross depends on the tweeters capabilities and how low one should cross also depends on any non-linearities that the woofer presents with. 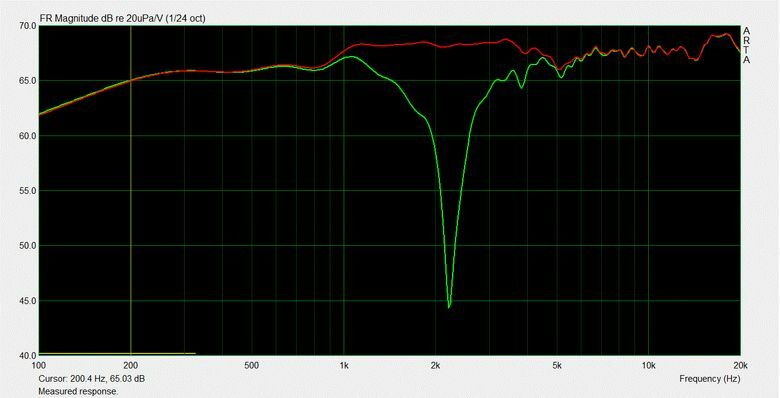 In this case we can see that the woofer has issues around the 4kHz mark. Crossing a reasonable amount lower than this makes sense, but until we measure the distortion profile of both the tweeter and woofer, how low is necessary, for the woofer, and how low we can actually go, for the tweeter, will remain a mystery. So lets de-mystify. First of all we have the woofer. Not the lowest of distortion around, epsecially considering these are low sensitivity drivers and I measure at a fix drive level, rather than SPL, but smooth, really smooth. The higher order products are kept decently low across the board with the second and third usefully low. Certainly this is not performance to sniff at given that the woofers were had for only £5.99 a piece. Ignoring the off-axis issues that would present and the response roughness around 4kHz, the distortion plot shows that we could cross anywhere we like without letting any non linear nasties through. The tweeter itself is a bit of a champ and back in the day it cost around £15 when at full price. It is reasonably sensitive at ~91dB/2.83V RMS, but the nice thing about it is that it's actually a proper 8 ohm load. These days 4 ohm tweeters seem to be the norm with 6 ohm coming in second place, it is nice to see a proper 8 ohm device for a change. As can be seen it has low levels of distortion all the way down to 1kHz with only a rise in the second order present. No I would not recommend crossing the tweeter this low but it does show that, when pushed, things don't all fly apart at the seams. High orders remain impressively low meaning that the tweeter is unlikely to start sounding bad even under high drive levels. The tweeter is more than capable and an obvious low frequency cut off of ~2kHz makes perfect sense. In combination with close C2C spacing this will produce a speaker that isn't fussy when it comes to vertical off axis listening positions, such as placing them besides a computer monitor at a desk where your sitting height could vary. Given the DSP the crossover design could not really be any easier. 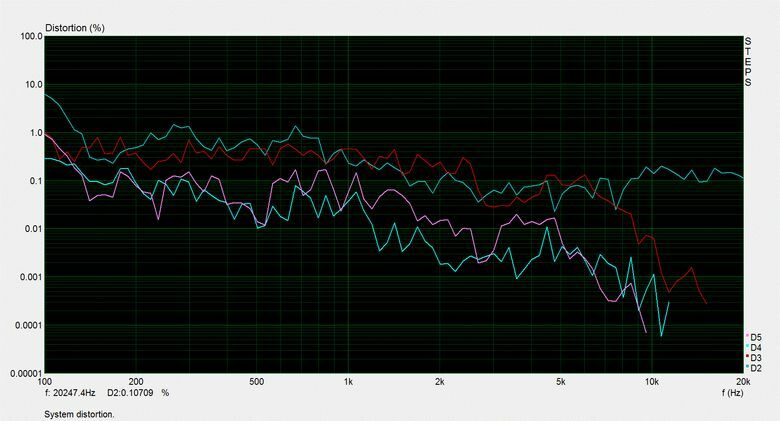 Excessive EQ should always be used with caution though in case it comes back to bite you in the behind. 4th order slopes of the LW variety were chosen at around 2.2kHz with only 3dB worth of BSC. This was done on purpose so as to make the speakers reasonably flexible. 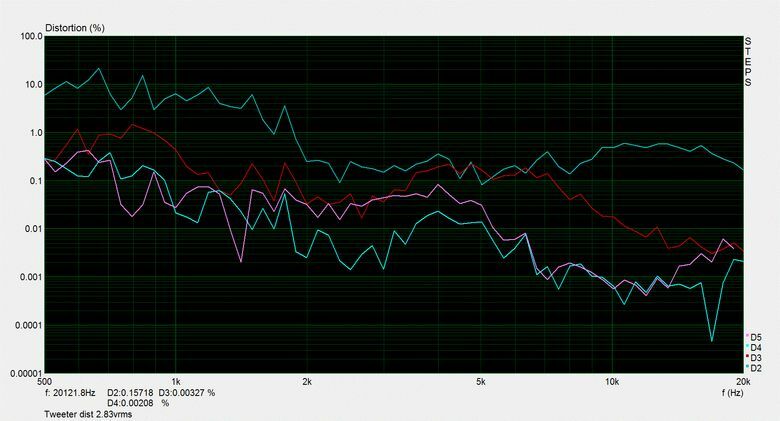 The reverse null is shown below showing good driver integration, not really surprising considering that phase alignment was on the table with the DSP. Although the transfer functions of the bi-quads were reliable the phase alignement part of them was less so given the software at my disposal. Fine tuning was necessary and the measured results after doing so are as follows. A good match so lets move on. Next up are the transfer functions used to arrive at the system response shown above. Starting with the tweeter and followed by the woofer. As can be seen fairly straightforward stuff with a little bit of bass equalisation implemented via a Linkwitz Transform. The original distortion measurements of the drivers were taken via very low distortion solid state amplification. Given the amplification used here is considerably different in nature it helps to measure the final system to check that everything is working properly. And above we see exactly what we'd like to see. The distortion profile follows what you'd expect given how the individual drivers measured. A slightly rising distortion profile towards low frequencies due to bafflestep gain with the distortion decreasing as the tweeter comes in above 2.2kHz. As expected these loudspeakers sound excellent. No they don't go amazingly loud, but they weren't intended to and if that's your desire you really need something a whole lot bigger.